Russia’s leading charter carrier, Azur Air, opened three line maintenance stations outside Russia in April—two in Thailand, Bangkok and Phuket; and a third in Cam Ranh, in Vietnam. All of the stations, including the fourth one at the airline’s base airport Domodedovo in Moscow, are approved by the aviation authorities of Bermuda (BDCA). Azur Air received its OTAR 145 certificate in January this year. The stations will provide line maintenance on Azur Air’s fleet of five Boeing 767-300 (with Pratt & Whitney PW4000 and General Electric CF6-80 engines) and nine 757-200s (with Pratt & Whitney PW2000 and Rolls-Royce RB211). In the first quarter of this year, the carrier’s station in Domodedovo performed its first A-checks on a Boeing 757-200 and a Boeing 767-300. Azur Air’s communications director Anastasia Matyushina told Russian Aviation Insider that the entire network is fully equipped for line maintenance procedures with OEM-approved tools and equipment. The company employs over 50 technicians and engineers, about 40 of whom are qualified as certifying staff. 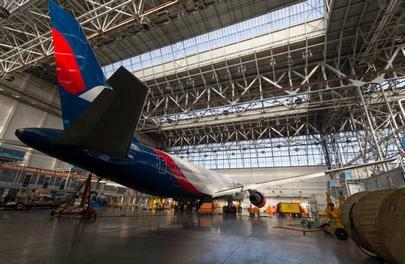 In April, Azur Air’s technical director Igor Marudo told Russian Aviation Insider about the airline’s plans to open line maintenance stations in Russian airports. “At this point we have technical support for our aircraft in each airport where Azur Air operates. But we have plans to open line maintenance stations in those airports where the fleet will be based. This is a reasonable and logical solution. We are considering opening three stations in Russian airports within the year,” he said.